So far, Changsha Huanghua International Airport has been connected with 123 regular domestic and international air routes of 43 airlines. The navigable destinations include the large and medium-sized cities in mainland China, Hong Kong, Macao and the cross-strait flights to/from Taiwan, as well as international routes to/from Cambodia, Thailand, South Korea, Japan, Singapore, Vietnam, German, Maldives, America and Kenya… Every week, more than 3,000 flights with 350,000 available seats are taking off from this airport. How much does it cost to fly to Changsha from overseas destinations? Generally, there are more Asian flights operated in this airport. The fare from Singapore to Changsha is about CNY 2,000 - 3,000 and you can get some discounted tickets below CNY1,500 every now and then. 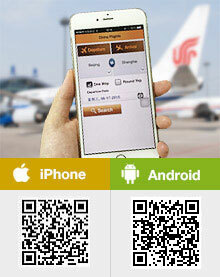 If you fly from Seoul, you may spend about CNY1,200 with special discount which saves about CNY 300 - 1,000. You can get real-time flight ticket prices or prices of more flights via the search box on page top. 1. Take flights of the cheap airlines. For example, the fare of Thai AirAsia flying from Bangkok to Changsha is about CNY1, 000 and the Thai Airways International is about CNY2, 000. Do not forget to check the baggage allowance, as the charge on the extra luggage can be high. 2. Make a transit if you are not pressed for time. For example, if you fly from Osaka directly, the fare may flows from CNY 3, 000 to 13, 000. If you transit in Beijing or Shanghai to Changsha, it may only cost about CNY 6, 000 in all. 3. Pay continuous attention to the ticket fare 1-3 months in advance on airlines official websites. They give tickets with special discounts every now and then. 4. Book the back-trip ticket together and it sometimes comes with bigger discount. 5. Compare ticket prices on different booking websites or APPs, like Sky Scanner and choose the cheapest one. Located at Huanghua Town, it is about 25 kilometers (16 miles) from the downtown Changsha. At present two terminals are serving passengers at home or abroad. Passengers who take the flights of these eight domestic airlines, including Air China, Shenzhen Airlines, Shandong Airlines, Chengdu Airlines, Kunming Airlines, Okay Airlines, Joy Air, Tibet Airlines should check in and board the planes in Terminal 1 while passengers of other airlines should go to terminal 2. There are 8 airport shuttle lines connecting the airport and downtown. Please let me know how much does it cost to fly from Nanjing to Guangzhou round trip and flying time . Please find me a low cost flight. What is your travel date? There are many flights from Nanjing to Guangzhou daily. Since the airfare discount always changes, you’d better search the specific ticket price on the webpage with your departure date. And you are suggested to book it in advance.